On Saturday November 14th, 2015, in New York City, Face Flawless Skin celebrated the launch of their brand with the inaugural Face Flawless Skin Clinic, a day long skin care event designed to help women of color achieve their best skin. At one of the city's chicest hotels, The Martha Washington, approximately one hundred women gathered for two 2-hour information sessions. Face Flawless Skin Founders, Danielle Gray, Christene Carr and Felicia Walker Benson were joined by experts from Olay, RoC Skincare, Guerlain, celebrity makeup artist Danessa Myricks, and esthetician from Lespri Mobile Spa, Rachelle Richardson for each of the two in-depth panel discussions. Each session addressed many of the skin care issues that women of color commonly face. In addition, Danessa Myricks demonstrated how to use makeup to cover blemishes without overpowering the skin. 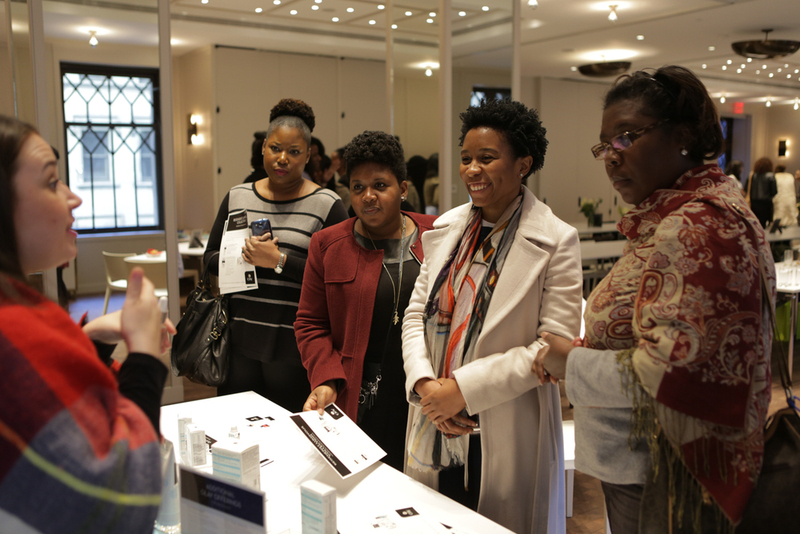 Attendees were treated to product testing and demonstrations from Olay, RoC Skincare, and Guerlain and all guests received a Face Flawless Skin gift bag valued at over $200. Olay Skincare gave guests the fundamentals of a more even skin tone with their Regenerist Luminous line. Guests were given the keys to starting an anti-aging regimen thanks to RoC Skincare. French luxury brand Guerlain used bronzer to show guests how to add dimension and brightness to the face. Celebrity makeup artist and educator, Danessa Myricks, demonstrates how to use makeup to enhance the skin without over powering it. A huge thank you to everyone who attended the Inaugural Face Flawless Skin Clinic! Click here to subscribe to Face Flawless Skin on Youtube and see even more pictures on Facebook! Keep the conversation going and stay connected! Use #FaceFlawlessSkin on Instagram, Facebook and Twitter and be sure you are following Face Flawless Skin for all the exciting things we have in store.